Pick a book. Grow a Reader! This series is part of Scholastic's early chapter book line, Branches, aimed at newly independent readers. With easy-to-read text, high-interest content, fast-paced plots, and illustrations on every page, these books will boost reading confidence and stamina. Branches books help readers grow. In the 12th book of this fantasy series, Maldred is after the powerful Gold Key! Drake and Rori travel to the lair of the Gold Dragon to help protect the key. There, they meet a new Dragon Master named Darma. If dark wizard Maldred gets his hands on the Gold Key, he will be one step closer to controlling a powerful Earthquake Dragon. Can the Dragon Masters stop him before it's too late? The action is nonstop in this exciting, heavily illustrated early chapter book series! 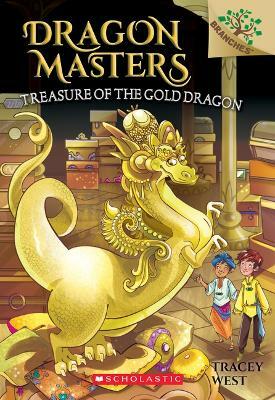 Tracey West has written more than 200 books for children and young adults, including the following series: Pixie Tricks, Hiro's Quest, and Dragon Masters. She has appeared on the New York Times bestseller list as author of the Pokemon chapter book adaptations. Tracey currently lives with her family in New York State's Hudson Valley. She can be found on Twitter at @TraceyWestBooks. Sara Foresti grew up in a small town in Northern Italy, and graduated from graphic design school in 2007. She works as a freelance illustrator on everything from children's literature to greeting cards, educational and fiction books, digital apps, videos, and other work in design and comics.